Jason Cone is the executive director of Doctors Without Borders/Médecins Sans Frontières in the United States. NEW YORK/GAZA, May 14 2018 (IPS) - The exit wounds are fist-size. Bone is pulverized into dust. This is the reality for half of the injured patients received in my organization’s clinics since the launch of the Great Return March in Gaza. Over the past month, the number of people treated in Doctors Without Borders/Médecins Sans Frontières’ (MSF) clinics in Gaza is more than were treated in all of 2014, when Israel’s Operation Protective Edge was launched in the Gaza Strip. MSF clinics admitted almost 781 trauma victims between March 30 and May 10—more than one-third of the 1,916 trauma casualties recorded by Gaza’s health ministry. The situation may worsen with the planned move of the US embassy to Jerusalem on May 14 and the approach of May 15, the anniversary of Israel’s founding, regarded by Palestinians as the “Nakba,” or catastrophe. Medical facilities, including our clinics, are completely overwhelmed and will soon be unable to manage additional wounded. The health system, strained by the ongoing blockade of Gaza, is on the verge of collapse. Even though there is not a war in Gaza, the injuries sustained by our patients are terribly similar to what we see in conflict zones. We estimate that more than 39 percent of our 554 current trauma patients will require long-term rehabilitation, lasting at least until the end of the year. While the majority of our patients are young men around 20 years old, we have treated 98 children and adolescents under 18. Ninety-one percent of our trauma patients were shot in the legs, many at close range. Several will be handicapped for life, putting tremendous pressure on the already beleaguered health system, impoverished families, and the whole society. The ongoing Israeli and Egyptian blockade of the Gaza Strip and recent US funding cuts to the UN’s Relief and Works Agency for Palestine Refugees, or UNRWA, exacerbate the dire situation. 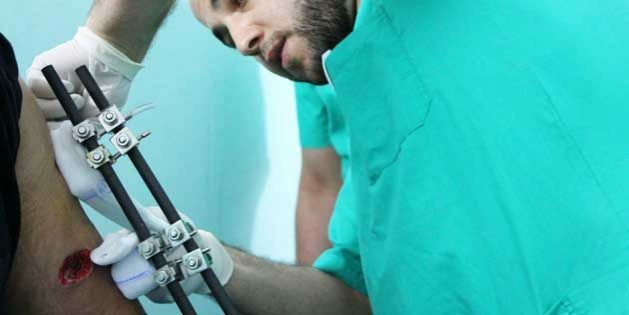 Gaza hospitals have emptied inpatient wards to make space for the influx of wounded. Patients with chronic health issues were already struggling from the lack of chemotherapy drugs, kidney dialysis, and diabetes management. Now they have been displaced, and either do not have access to health care or will be forced to turn to expensive private clinics. Most of our wounded patients say they have nothing to lose, no hope, no jobs, nothing. They tell our staff that they just want to go back and die at protest sites. Some are returning to the demonstrations with casts, on crutches, or with external fixators holding together shattered bones. The severity of the injuries demonstrates that Israeli forces are resorting to disproportionate force to incapacitate the protesters. The result is unnecessary damage and suffering. Additionally, the Israeli government doesn’t regularly facilitate access to health care outside of Gaza, which is needed due to the complexity and severity of injuries. According to the World Health Organization, since March 30, of the 27 patients who have applied to be treated outside of Gaza, only 9 have been approved. Failure to transfer these patients will increase pressure on the public health system, and increase the risk of otherwise preventable infection-related amputations. Lastly, Israel and Egypt need to ease the 10-year blockade of Gaza, which contributes to the ongoing despair and drives people to the fence to protest. Egypt must also open its border with Gaza and permit the flow of humanitarian aid. Israel also must ensure adequate supplies of electricity to the Strip. Hamas leaders in Gaza must cease encouraging any kind of violence and glorifying “martyrdom.” The Palestinian Authority must also enact an emergency response plan, ensure payment of salaries to health-care personnel, replenish medical and electricity supplies for hospitals, stop restrictive measures against the population, and immediately add inpatient capacity to deal with the surge of wounded expected in the days ahead. The divide between the Palestinian Authority and Hamas is more painful today for the population than ever. But the Israeli government and Palestinian leaders are not the only ones responsible for recent events. The Trump Administration’s decisions to recognize Jerusalem as the Israeli capital, to move the US embassy from Tel Aviv to Jerusalem, and to enact an 83 percent funding cut to UNRWA, have thrown gas on the fire. Since the US embassy move was announced in December, MSF clinics have seen a massive increase in trauma cases, from just a few per week to more than 20 cases weekly even before the current protests. Today, we are seeing more than 20 cases per day. This is on top of the normal workload, including burn victims from accidents linked to the use of unsafe fuels for home heating and cooking, due to the blockade-related shortages in Gaza. Electricity and water shortages, along with an ongoing dispute between Hamas and the Palestinian authority, have led hospitals to freeze elective surgeries. The UN’s Office for Coordination of Humanitarian Assistance (OCHA) estimates that 36 percent of essential medicines and 32 percent of medical supplies are missing as a result of the blockade and lack of funds. The US government must use its diplomatic influence to ensure a more proportionate use of force by the Israeli government, and make it a priority to restrict the use of live ammunition. The collapse of all public services heightens the risk of complete disaster in Gaza. Egypt and Jordan should also be prepared to facilitate medical evacuations of patients for long-term care that will likely be unavailable in Gaza. Referrals to the West Bank may also be needed, and these should all be facilitated on the basis of medical need—not political considerations. While there is plenty of blame to share over the latest violence in Gaza, the focus should be on mitigating human suffering now and preventing wider harm. As the toll of dead and wounded mounts, an entirely avoidable—potentially even deadlier—blood bath may be just days away. This op-ed can be found online here.